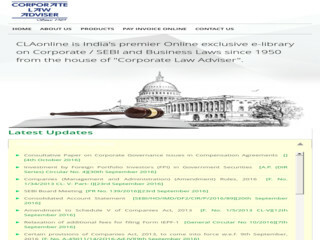 CLA Online is a product of Corporate Law Advisor. TI provides digital contents of Corporate Law Advisor Magazine along with Business Law Suppliment. IT covers all volumes since its inception of both Corporate law Adviser and Business Law Supplement. It provides comprehensve search techniqes like artilce search, case law search, notificaiton search, ciruclars earch, acts search, rules search and regulations search. IT can be accessed through www.claonline.in configured within the IP Range of NLU, Delhi.